Mega Moolah Isis - 30 free spins and bonus games - progressive jackpot! Mega Moolah Isis – big jackpot slot! Play one of the most iconic progressive slots, Mega Moolah Isis, and stand a chance to become an instant millionaire at Microgaming Casinos! For example, join Euro Palace Casino and get 100 free spins and $/€500 free welcome bonus. This slot salutes the ancient Egyptian goddess of motherhood with a mythological theme around the era of the Pharaohs. Mega Moolah Isis is driven by Mircogaming software, meaning the graphics and audio are of the best quality, making this game an immersive thill to play. A coin denomination comes in three options: 0.01, 0.02 and 0.05, with the maximum 5 coins per line. A maximum bet per spin is $/€6.25 (125 coins). Mega Moolah Isis has 5×3 reels, 25 fixed paylines, and is filled with Wild and Scatter symbols, Multipliers, Free Spins and a Gamble feature where you can double or quadruple your winnings. You will be awarded with Free Spins when you land 3 or more scatters (which are the hawk symbols) on the reels, which will give you a generous 20, 25, or 30 Free Spins, and these carry an amazing 6x multiplier. When the beautiful goddess appears, she becomes the Wild symbol, who doubles wins and enables winning combinations. However, the randomly triggered Jackpot Wheel will be most welcomed! To make things more interesting, some card symbols like A, K, Q, J, 10, and 9 have been implemented. The other Egyptian-related symbols are Ankh, Vase, Orb, Brooch and Lotus. 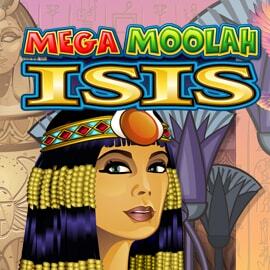 The Mega Moolah Isis slot is of course, available to play online on mobile devices. The game is much the same as the desktop version, which mwans it is compatible to play on Andoid/iOS tablets and smartphones. Mega Moolah ISIS is one of the best progressive video slots keeping you entertained and thrilled for hours. The beauty is that you can hit the biggest prize with the lowest bet possible of 0.25. Even if you do not reach the mega-sized award, you’ll still have much entertainment and decent payouts. Without doubts, this is the most famous Microgaming online slot and is likely to remain in that position for ages to come. The blend of huge wins and top-end game play will be hard to beat by any onther slots, even the most advanced ones. Just to remember, the biggest Mega Moolah’s jackpot win amounts to £13,212,882 and it was won by UK’s soldier in 2015 at Betway Casino. This big win has made it the biggest ever Microgaming progressive jackpot win on an online slot.